In northern Europe, there is a swamp of human organs. Marsh or swamp of human organs from the people - it's a natural burial of human corpses that are found in sphagnum bogs in Northern Europe. Instead expansion swamp created ideal conditions for the preservation of the body, leaving the skin and internal organs are relatively intact. 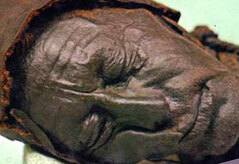 Thousands of corpses found can be attributed to the Iron Age. Revealed a large amount of evidence that they were all killed. It is believed that the corpses of the victims of pagan rituals or dead from some form of criminal punishment. However, no convincing explanation as to why thousands of bodies were dumped, found, especially since the whole of Germany, Ireland, the UK, the Netherlands and Denmark, they were found by chance.